At first, it looked like the dream had been left unfulfilled. 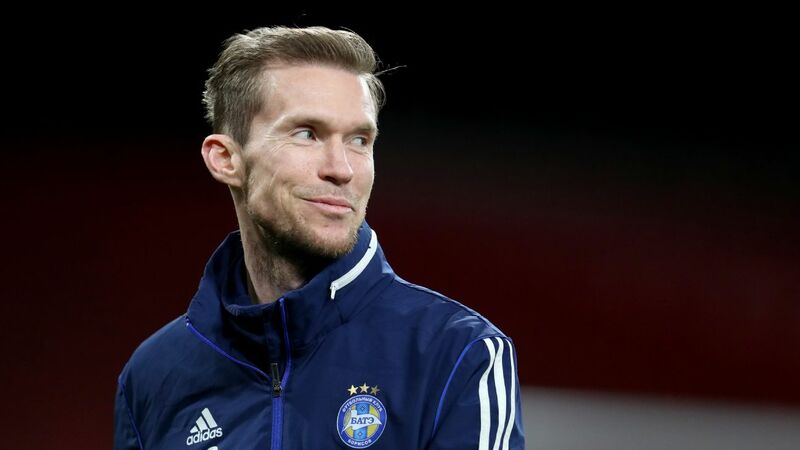 Alexander Hleb was a free agent when BATE Borisov were drawn against Arsenal in the Europa League group stage in August 2017. The veteran, 36 years old at the time, dearly wanted to face his beloved former club, and memories of his three highly successful seasons in the Gunners' shirt between 2005 and 2008 are impossible to forget. Back then, Hleb was considered one of the top midfielders in the world, and he wanted to rejoin the Belarusian champions for the fifth time to return to the Emirates Stadium. Immediately after the draw, Hleb called BATE chairman Anatoly Kapsky and made himself crystal clear. He even offered to play for free. Incredibly, the club refused, and Hleb was left heartbroken. "The whole story isn't known, but BATE didn't think Hleb could be useful at the time," local journalist Dmitry Siniak said. "The club had Montenegrin playmaker Mirko Ivanic in his position, and the two allegedly couldn't play together. BATE also may have felt that those who helped to qualify for the group stage deserved the chance to play in it, but there could be other influences as well. Kapsky made most of the decisions himself." The refusal didn't go down well with most BATE fans, who felt Hleb had been treated unfairly. The midfielder enjoys a legendary status in Belarus, and there is consensus that he is the nation's best player ever. Only Sergei Aleinikov, who represented the Soviet Union at two World Cup tournaments in the 1980s and had a spell at Juventus, can be considered a legitimate alternative. "Hleb was a key performer at Arsenal and was signed by Barcelona. That definitely makes him the greatest," Siniak said. Yet it turned out that even the greatest don't always get what they want. What might Hleb feel when he sets foot in Emirates Stadium again? One thing is certain: He should receive a very warm welcome. Arsenal fans still adore him; some even travelled to Belarus last week with shirts bearing his name. It will be a moving and emotional experience but also a sense of what could have been. Should he have left the Gunners in 2008? What would have happened if he chose to remain with Arsene Wenger, a coach who knew how to get the best from him? Hleb tried to return to BATE ahead of their 2017 clash with Arsenal, but the club refused. He's set to start vs. the Gunners on Thursday. Hleb was the perfect fit for the Arsenal sides of the mid-2000s. Having learned from Bulgarian midfield maestro Krasimir Balakov during their time together at Stuttgart, Hleb possessed the vision and technical skills to make the Gunners tick. His touches were a joy to watch, and his passing range was exquisite. It explained why Pep Guardiola made him the top target ahead of starting his tenure at Barcelona in 2008. "Pep called me personally and promised that I will be in the starting lineup. He even named it all. Xavi and Andres Iniesta in the middle, Leo Messi on the right, myself on the left, Thierry Henry up front. Ronaldinho, Samuel Eto'o and Deco were supposed to leave," the midfielder recalled. Yet Eto'o remained at Barcelona, Henry played on the left, and Hleb was forced to wait for his chance. The stagnation left him deeply disappointed. He didn't understand Guardiola's decisions and didn't really respect them. His career was ruined there and then. And he is courageous enough to acknowledge that in retrospect. "My attitude was wrong. I made problems after not starting in a couple of matches. I blamed Guardiola for that and asked him why he made he leave Arsenal. Pep was astounded. He told me that there are a lot of games ahead of us, and everyone will get a chance, but I didn't listen. I was angry and misbehaved," Hleb said in 2016. "If I hadn't acted like a fool, I could have played for Barca for many years." Attitude played an important role in his downfall as well. When loaned out to Stuttgart in 2009-10, he felt so superior to his teammates that any kind of proper cooperation was impossible. Choosing Birmingham City in 2010-11 also proved disastrous because their long-ball style didn't suit Hleb's skill set. By the time he left Barcelona for good in January 2012, his image was damaged beyond repair, and his unusual and somewhat bizarre next chapter began. Hleb's best years were spent as the Gunners' technically gifted midfielder, but the allure of Barcelona proved too great to resist. Homesick at times, Hleb loved to come back to BATE but only for short periods because he became bored with the low level of domestic football in Belarus. He also had two disappointing spells in Russia with Samara, represented Konyaspor and joined Genclerbirligi twice, having established magnificent relations with their president. During those years he also had offers from China, India, Israel, Kazakhstan and even MLS, but nothing came out of it. Many wondered why Hleb remained on a path that seemingly led nowhere, but those who know him aren't surprised. "Alex just loves football," Siniak said. "He is a top professional who always gives his all in training and plays with a smile. BATE fans adore him, and his returns to the club were always celebrated, even though he was criticized in the press for not trying hard enough in the local championship fixtures. Having earned a lot of money over the previous decade, he is not interested in high salaries. He is having fun." Hleb also kept going in hopes of meeting Arsenal again one day. It was a disappointment when he wasn't allowed to do so in 2017 -- Arsenal ended up winning the game 6-0 at the Emirates that time -- but now his time has come. His very best days in football were spent in front of Arsenal fans, and this is his last opportunity to shine in front of them again. They will cherish the moment too, even though they won't be pleased if he and BATE Borisov win.